The concept of the game is to go with the spirit of passing the torch of Special Olympics, but this time it’s passing as many hearts, a motive of special Olympics, as possible in a time limit to the other basket. 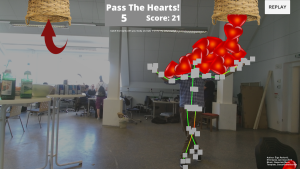 The playing field is too big for just one person (certain tricks make it harder for one person) so multiple people (max 6) can participate and create a passing chain so that more hearts can pass safely. 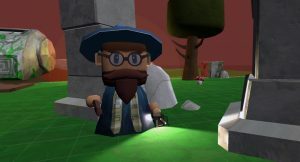 The game is easy to learn, provides emergent gameplay opportunities and is physical in nature. Graphics can be changed to accommodate branding opportunities. The mobile app was developed by Thomas Haller (Programming), Stefan Putzinger (Music and Sound effects), Mathias Rauch (Programming, 3D and Animation), Manfred Rohrer (Artwork and Textures). 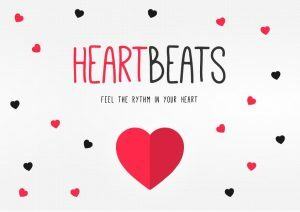 Heartbeats – Feel the rhythm in your heart is a thrilling mobile game for musically players. The correct heart rhythm must be found. Only those who tap the screen in the perfect groove will produce the rhythm of the heart. The heart sends out positive waves when it is in time with the music. But being out of rhythm, the heart will show its dark side – little black hearts will make us sick. But life isn’t always beer and skittles, sometimes the beat changes, but with a lot of love and some sense of rhythm, it also creates 140 bpm or more. 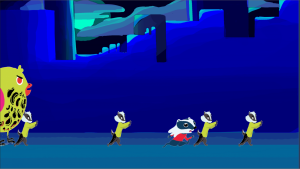 The player finds himself in the role of the main character in a 2D game where he is chased by enemies.The main character starts running away automatically and it depends on the player if the escape is successful. The player’s heart rate controls the speed of the main character: The lower the heart rate, the faster the main character runs. So the player has to keep a clear head if he wants to win. In Funky Flatline Hans had a car accident and is severely injured. You have to drive Hans to the hospital to save his life. Be careful to keep track of his heart beat to reanimate him. And watch out! There are some enimies which try to keep you from saving him. FreeCom’s innovative feature lets users create their own network by connecting to each other: Each person acts as a postman giving messages to either the next person until everyone is reached or to just a single targeted person, by mixing people’s physical movements with technologies to achieve connectivity. 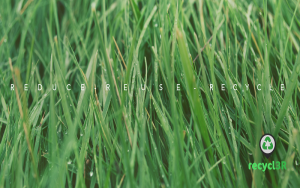 Recycl3R is a mobile app that assists citizens in the task of recycling . It gives citizens direct access to waste disposal information, which saves their time and encourage them to recycle.